Love this chair, impresses my clients. 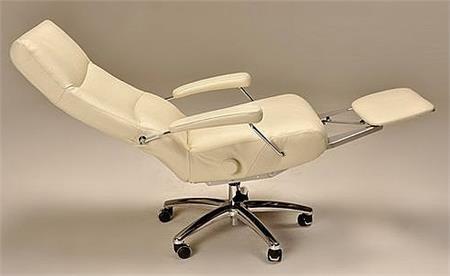 Between meetings, I can recline back and close my eyes to do some meditation to keep myself in balance. Super fast delivery from Accurato - only 6 days after I ordered, it came to my office. 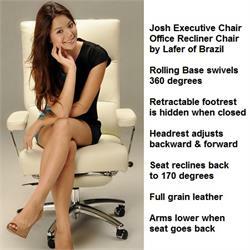 Josh Executive Recliner Chair by Lafer - Ergonomic Office Chair - Modern Leather Recliner and Desk Chair by Lafer of Brazil. 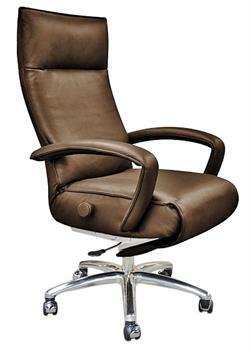 Josh Executive Chair with Leather Upholstery. 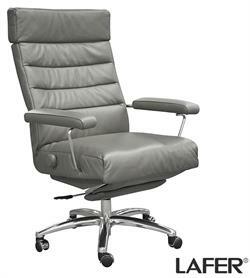 Leather Office Reclining Chair by Lafer. Josh Executive Chair offers two distinct functions in one office chair: an extremely comfortable desk chair and a recliner with all the features of the Lafer recliners to complete your home office or corporate furniture setting. The Josh Executive desk chair by Lafer has a horizontal seat for a comfortable but straight work position. 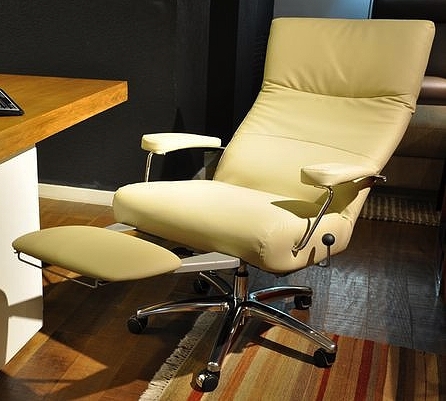 When reclined, the seat tilts to a relaxed position for a nice rest or nap after a hard day at work! 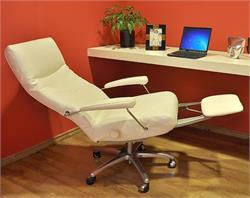 You purchase a recliner and get a desk chair for free. 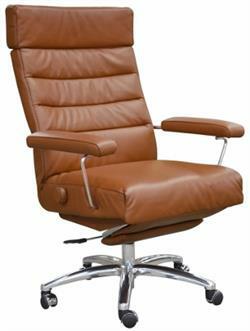 Body of Lafer Task Chair in top grain leather. Castor base of desk chair in five star die cast aluminum swivels 360 degrees and is height adjustable. Fully retractable footrest. Armrests lower with the backrest movement for comfortable sleeping. Josh Executive Recliner Dimensions: Total Height 45-49", seat height 17.7-21.6", total width 29", depth upright 31.5", depth reclined 67"
Lafer Furniture of Brazil has created high quality furniture, recognized worldwide for its comfort, elegance and ergonomics for over 80 years. 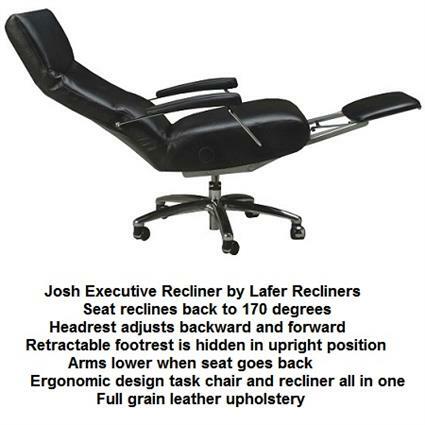 Lafer specializes in leather recliner office furniture, desk chairs, executive chairs, sofas and home theater seating and produces the best in contemporary furniture design. 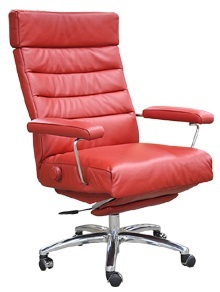 Strict quality control of Lafer recliner chairs ensures tasteful furniture, made with high quality materials and finishes to last a lifetime. 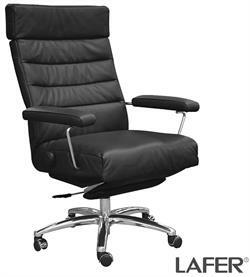 A Lafer recliner chair is an investment in quality, style and comfort and will complete your office furniture setting. 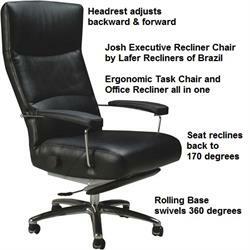 Every Lafer recliner features independent backrest, headrest and footrest controls. Recline to a full sleep position. Headrest adjusts for TV watching or for sleep. 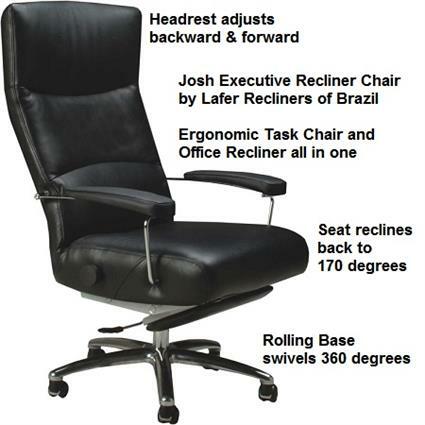 The fully adaptable adjustment systems of the Lafer modern recliners have been developed over the past 20 years to provide the best experience the comfort of a reclining chair can offer you, whether in an active position, such as talking, reading, watching TV or working with a laptop, or in a position of pure relaxation, rest or sleep. With a Lafer recliner, the whole body remains in the correct position for total relaxation. 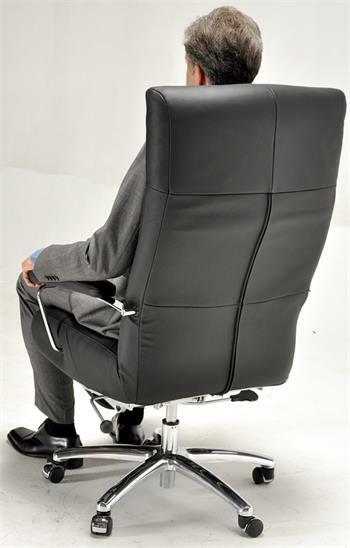 A true one size fits all recliner, owned by thousands of users worldwide. Adjustable armrests lower for comfortable sleeping (except for models Billie and Bjork). 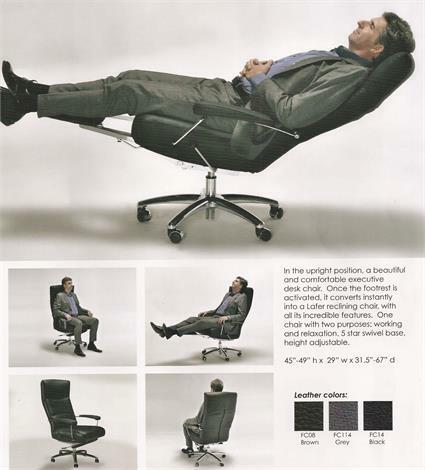 Bjork can be a single recliner or connect an infinite number of recliners for theater seating. 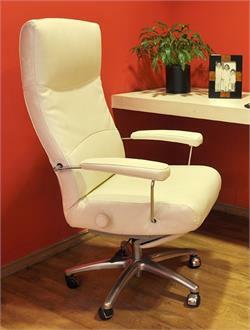 Lafer Executive Chairs, Desk Chairs, Recliner Chairs and Lounge Chairs come with top grain leather. Many colors in stock. Call or email for lead time on colors of your choice. Accurato Furniture Store believes that the purchase of contemporary furniture should be easy, straightforward and enjoyable. 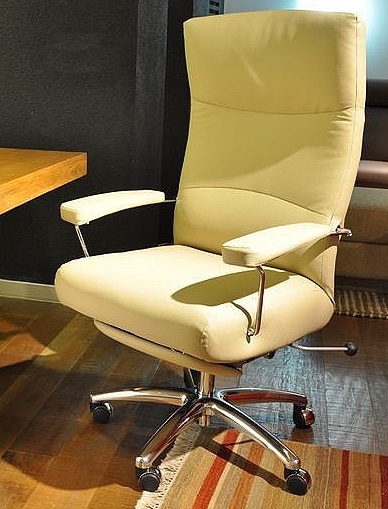 Accurato Contemporary Furniture Store is a trusted online retailer for high quality international brands such as Lafer Recliners, Executive Chairs, Office Furniture, Task Chairs, Office Chairs, Home Theater Seating and Lounge Chairs. Our clients LOVE our fanatical customer service!